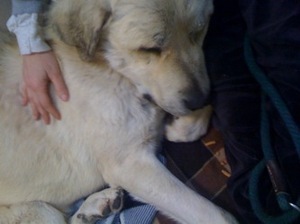 Each time I walked past the Great Pyrenees in kennel SD36, his head was down. He barely moved his eyes to track my comings and goings. According to his chart, he’d been surrendered by his owners the day before. They called him Oso. I’d seen depressed dogs before, dogs who were completely shut down. Oso seemed more than shut down – he seemed heartbroken. He slowly sat up when I crawled into his kennel. I crouched on the blanket with him, and he leaned his massive head against mine. Within a few minutes, he was slumped back down again, resting as much of his body on my lap as would fit. I felt awful for this dog. He sucked in every ounce of affection I could give and seemed to ache for more. It was as if he sensed he’d been abandoned. I sat there for a half hour, tears streaming down my face, cooing, petting him, assuring him it would be all right. With puffy eyes and a lump in my throat, I went to find a shelter administrator. I’m really worried about the dog in SD36, I said. Anesthesia. Well. I guess it resembles heartache if you’re not expecting it. I smiled. Being wrong never felt so right. Note to self: Lighten up. 3.16.10 UPDATE: OSO HAS BEEN ADOPTED!